Do you ever feel like everything you do is wrong; that you can do nothing right? I do sometimes feel like that. I can’t seem to keep my house clean enough or be consistent enough with getting enough school done in a day. My laundry system is failing (ok ok it’s currently non-existent). If I have a great day with school and chores, I somehow can’t manage to get dinner cooked. When things start feeling overwhelming ~ the lesson plans aren’t done, the laundry is piling up, menu plans are a distant thought in a galaxy far far away ~ it becomes important to think about the things you are getting right. For me, anyway, I need to step back and look at what is going well or when I am doing things right. This past week I finished reading Getting Rid of It: Eliminating Clutter from Your Life by Betsy and Warren Talbot. I liked the book OK (that’s a two star rating on Goodreads). I don’t think a 40 something year old, home schooling mama who doesn’t have an outside career is the intended audience but there were some things I could take away and apply to my own house. I’ve posted before about how I want to be when it comes to organization and I’ve written a blog post or two or three about organizing. It might sound like I’ve got it all together but I don’t. The problem though is that sometimes I focus so much on how NOT together I am that I fail to see those tiny tings that I did get right or am doing right. At first, while reading the book, I got hung up on the fact that this couple was a) childless, 2) both working, 3) getting rid of everything they owned so that they could travel the world. I think a tiny part of me was jealous about traveling all over the world but that was the easy part of get over. I wanted to be a stay at home mom and though I would love to travel the world, I did do lots of travelling in my BC (Before Children) life. Many of the solutions proposed just did not appeal to me. I just could not imagine inviting my friends (FRIENDS!!) over to buy my stuff. Offering stuff for sale? No problem. My friends buying stuff from me? No problem. Having a party for the sole purpose of getting my friends to give me money and take my things away? Um no. Just not my style. It’s beyond my comfort zone. Oh right, I wasn’t going to focus on what I was doing wrong. I was going to focus on the bits that made me feel good because I was doing something right. First, I found something I had done right in the kitchen. Earlier this year, a friend of mine and I were talking about decluttering and decluttering methods. She described one suggestion she had read (maybe she read it from this book? I don’t know.). Here’s the gist of the idea: empty the contents of your kitchen drawer into a box. When you use something it goes back in the drawer. At the end of 30 days, whatever you don’t use is still in the box and you can get rid of it. I blogged about it last January in my O is for Organizational Wanna Be. The biggest problem with having way too many linens is how they pile up in your life, letting you drag our your laundry days because of your huge supply. Before long you have 2 or 3 loads of towels waiting to be washed along with 2 changes of bed sheets. Your linen closet is full of clean towels and your hamper or floor is full of dirty ones. Oh my. I am so doing something right. I read that and I laughed out loud. For real! I was grinning from ear to ear. I’m smiling right now as I type this up. Do people seriously have that many linens? This fall I will celebrate 20 years of marriage and for the first 19 years, I only bought 3 towels maybe? Oh and a dozen or so wash cloths. All the towels we owned had been wedding gifts with a few Christmas gifts. We hadn’t had new towels in 10 years. We finally broke down last Christmas and bought a dozen large, soft, fluffy bath towels. We also bought two really large fluffy and wonderful bath sheets for ME. Really good quality. Before that if I am not sure I even owned enough towels for two loads of laundry. I guarantee that if I have two loads of towels that there are no clean towels in my linen closet. Oh and you know what else I am doing right? I only have one really good set of sheets for my bed. I do have a back up set but I tend to wash my sheets, dry them and put them back on the bed. I’ve been thinking I want to own another set of sheets. I might have two loads of sheets to wash but that is for 6 beds! Anyway, I love that when it comes to decluttering my kitchen and having a streamlined linen closet I am Doing Things Right. How about you? What are you doing right? Check out this week’s letter! This is the last Friday in August. I am very sad to see August end. I’m sorry to see summer end. I love summer. Spring is my favorite season but oh I do so love summer here in the Pacific Northwest. 1. Turtlegirl, Tailorbear and Boobear went camping two weeks ago. They were with our Church. Like last year they camped at Mt Rainer National Park and went hiking. Unlike last year, they did not have a camera so this picture is from last year. 2. The grandparents arrived for a week long visit. They drove out. Yes DROVE. 2000 miles one way. Usually they fly, but not this time. They left a couple of days ago and we were already missing them as soon as the door had closed. While they were here we had fun playing games like Sequence, Farkle, TransEuropa, Clue and even the Doctor Who 50th Anniversary edition of Yahtzee. We fed ducks at the local park. The husband, children, and grandparents made a day trip to Mount Rainer for a picnic. I stayed home and wrote out lesson plans. It was a good visit with lots of memory making moments. 3. Speaking of the grandparent visit the girls took selfies or rather I am told the correct term is ussies with the Kindle Fire. I’ve been saying for 19 years that Boobear looks like her grandmother. She finally believes me. 4. We start school on Monday. I’ve blogged for 5 days as part of the Back To Homeschool Blog Hop. I think I might be ready to start on Monday. Though we won’t be doing a full day on Monday. We’ll be doing some First Day Traditions like French Toast with bacon and taking pictures. I’ve created detailed lesson plans for the first quarter for Tailorbear and some rough “do what comes next” type plans for Turtlegirl. Don’t tell but I am still working on plans for Supergirl but I did print her Frozen themed student planner for her to use while I use my printed TOS Planner. I have to take things week by week with her plans. Subscribe to the Schoolhouse Review Crew Blog Newsletter and receive the TOS Schoolhouse Special Learners Planner, plus your choice of one of the Student Planners -- Primary, Intermediate, or High School, absolutely FREE! *links to download your Planners will be included in your first Friday newsletter. I signed up this morning! (OK, I did it for the newsletters, I already have the planners.) I’m looking forward to seeing what pops up in my inbox! What have you been up to this week? What does next week look like for you? We’ll be busy with canning and school! Come join us over at the Pebble Pond for this week’s Edition of Random 5 on Friday! I know it’s Saturday and a Random 5 on Friday just doesn’t really flow on Saturday but this is certainly not the first time I’ve posted a Random 5 on Friday on a Saturday. I also need a q topic for ABC Blogging so this post has a theme. Cats are, I think, quirky by nature but some some kitty habits are strange even by cat standards. As a married couple Honeybear and I have adopted 4 cats and had one cat adopt us. Each cat has been completely different in personality and each one has had a least one quirky habit! 1. Cats like to play. That’s not quirky. Cats like to jump up on things. That’s not quirky. But Daisy liked to play with pens. She loved them. She loved to bat them all over the floor and chase them. She preferred pens or pencils over traditional cat toys like balls of string. What made her really fascinating to watch: she would help herself to her toys. She would jump up on the desk, pull a pen out of the cup, drop it on the floor, jump down and begin her play session. 2. Mo was our first cat. He did not like Honeybear. He tolerated me. He did seem to think Boobear was ok. Mo liked to escape from the house. It was like he had to get away from us. The quirky part? He always came back. He didn’t seem to like us and we thought he was running away the first couple of times but he always came home. 3. George is buff colored tabby. He’s a big cat. He likes to eat. I mean he loves to eat. He gets so excited and vocal about his food. His litter mate, Lacy enjoys her food but she is much more “normal”. She’ll meow a bit and rub against your leg and then wait, nearly patiently, for you to fill her dish. I think she exemplifies normal about-to-be-fed kitty behavior. George? He paces. He yowls, He rubs against you. He tries to climb the counter. He tries to climb your leg. He wants his food and he wants it NOW. 4. Speaking of eating and George. He has another strange eating habit or rather about to eat habit. If I am in the bathroom (you know taking care of nature’s call), he *must* rub against my leg and be petted before he will eat his food. He will sit in front of the toilet and wait. He won’t move until I pet him. He’s worse than my children. I cannot go to the bathroom alone. He seems to just know when I have “to go” and follow me. 5. Daisy had a thing for Arby’s roast beef. At least that was meat. Otherwise she just wasn’t too interested in people food. Lacy doesn’t seem to care about people food either though I suspect she likes yogurt as I have found a yogurt container left on the table licked clean. But the quirky cat thing? That’s George again. He loves fresh lettuce leaves and canned green beans. You can not leave lettuce out. We often get fresh lettuce from the Farmer’s Market or Bountiful Baskets. If you leave it on the floor while unpacking, better make sure he is not around. We discovered his love of green beans when he decided to help himself to Supergirl’s dinner. Thankfully she was finished. Mastering basic facts can be a chore. A student might master the concept of addition or subtraction but still need lots of practice and reinforcement to memorize the math facts. A common method to achieve memorization includes drill with flashcards. In this digital age you can also find online programs to drill those math facts. Many of those drill programs are flashy, colorful and are more “game oriented” than learning oriented. Usually those programs require a subscription because they are entirely internet based. UberSmart Math Facts from UberSmart Software is different. This Downloadable software comes with a license that allows you to install on all your [Windows based] computers. It is a computerized flashcard based drill program. There are no flashy characters. No quests to perform. No animation that can distract students. That sounds boring, doesn’t it? But it’s not boring. Really. Three of my girls used this program and I played around it. Not once did I hear “mom, this is boring. I don’t want to do this.” I like that it is focuses on the facts and not on gimmicky games to entice children to want to play. My girls were motivated to complete the problems because they liked the encouraging notes. UberSmart Math Facts is also different because it doesn’t just drill the facts. There are two modes: Learning and Practice, and two levels: Beginner and Intermediate. The Beginner level uses dots and the Intermediate level uses a more traditional looking flashcard. With the dot cards you can choose to show the numbers with the dots. In addition to the learning and practicing by drill, the program also offers keyboard entry practice. One of my hang ups about using the computer to drill math facts with young children is the student is often unfamiliar with the keyboard and has to hunt and peck for those numbers which slows them down. UberSmart has a Keyboard Entry listed under the Practice tab. I’ve been refreshing my 10 Key skills (see that screen shot above? That’s me. Fast but not quite accurate.) You do not need to have a keyboard with the numbers on the right. The number row of a standard QWERTY keyboard work just as well and still offer the student the opportunity to learn the location of those number keys. Parent can track student progress ~ There are several reports parents and students can view including mastery charts, test scores (grade book), progress reports, mastery dates, and competition achievements. You can even print the grade book! Some reports can be exported. Assessment & Mastery Tests ~ The Tests tab has both Assessment Tests so you can know what you need to do and Mastery Tests so that you know when you’ve mastered a set of facts. It is downloadable!~ I love that this is a one time purchase with a license to use it on all the [Windows based] computers we own. I installed this on Turtlegirl’s laptop and Tailorbear’s laptop as well my own. When Supergirl is a little more independent I can install it on her computer but she will have to start over as her progress is stored on my laptop. Admin Password ~ Even though this is installed on my students’ laptop, They cannot make changes because it is admin password protected. The Admin can add students, remove students and change student settings. Student Settings ~ The admin can customize some settings such as upper limits for multiplication and division, time per problem, and mastery speed. There is a feature that I cant decide if I like it or not: Full Screen. I like that it blocks out the computer desktop which can be distracting, but I do wish that it actually made the program screen larger. I was hoping when I set it to Full Screen that the size of the flashcards would be larger but all it really does is create a different, math related background. Age Range: Although this is geared for K or 1st through 6th grade it is appropriate for any one who needs to mastery the four basic operations or who just wants to improve their speed. NOTE: This is only available for Windows (XP, Vista, 7, 8). According to the FAQ page there are no plans for a MAC version. Visit the Schoolhouse Review Crew blog to read what others have to say about UberSmart Math Facts. All information is correct and accurate as of the date of this review. You can read my other Schoolhouse Review Crew Reviews to find more great products. 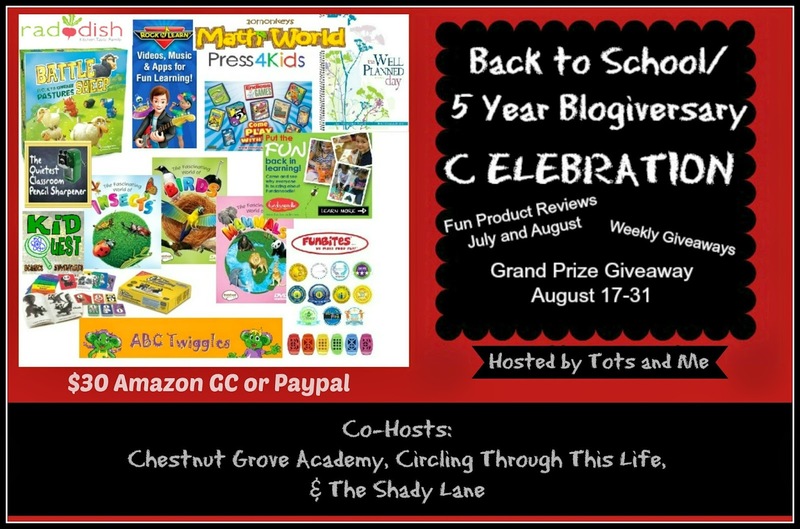 My friend Karen from Tots and Me is celebrating both back to school and her 5 year Blogiversary. I am so excited to co-host this giveaway with her! She’s giving away a set of Supergirl’s favorite DVDs! Fascinating World of Series from Brain Food Learning. I think this giveaway is worth entering just for a chance to win those! And we co-hosts are offering your choice of a $30 Amazon Gift Card or PayPal! You know you want to enter! 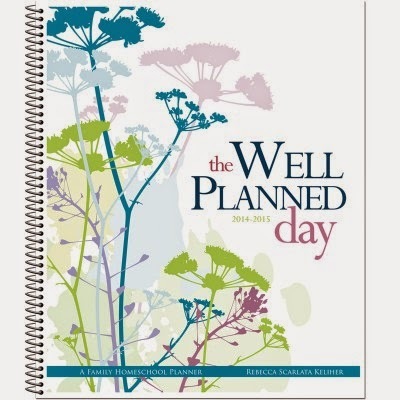 I almost wish I wasn’t participating so I could win a copy of The Well Planned Day. I reviewed an earlier edition of The Reading Game. How cool that they have a 2nd edition now. So check out the great products that Tots and Me put together! Have you used any of these products before? Back to school time is here! The summer, once again, just flew by and now it is time to think about school books, schedules, and learning. No matter how your children are schooled, there are plenty of goodies in this prize pack to stimulate those brains and get them learning. Let me introduce you to the wonderful sponsors of this giveaway. 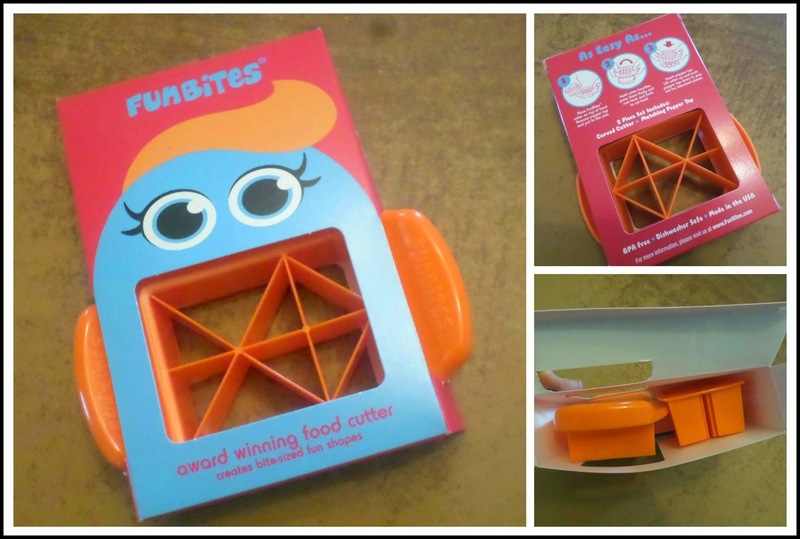 Winner's Choice FunBites Cutter for some kitchen fun. You can choose between triangles, squares, and hearts. Crazy Legs from Endless Games for some get-up-and-move fun. Great for phys. ed. time. Korner'd from Endless Games for those times you want a challenge and some family fun. 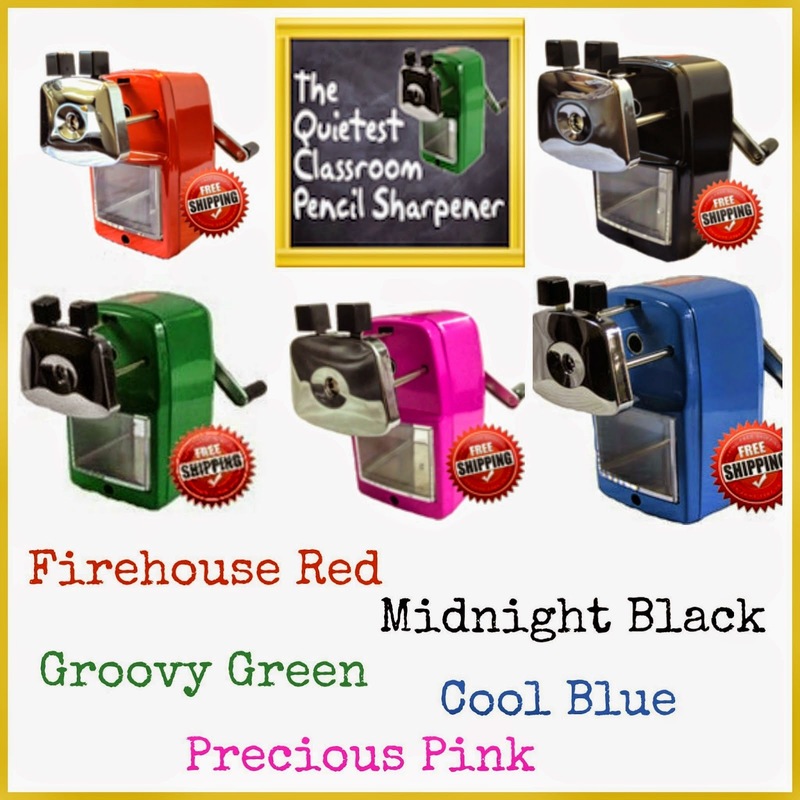 Pencil Sharpener from Classroom Friendly Supplies, because we have to keep those pencils sharp to get the work done. Battle Sheep from Blue Orange Games for family fun and sharpening your strategy skills. The Reading Game- The fast action memory game with picture flashcards and story books, to help your child learn to read. 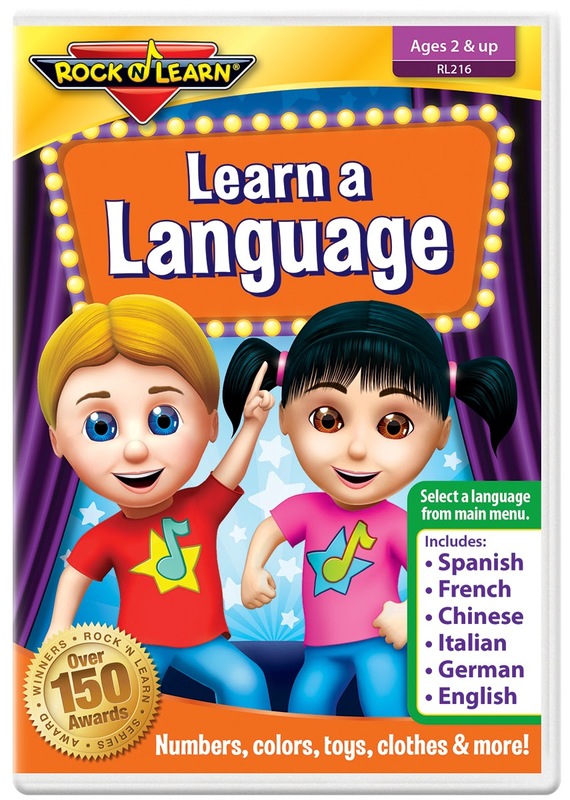 Winner's Choice of 1 Learning Activity Kid from Fundanoodle. Choose between I Can Build Upper Case Letters! and I Can Bead, Lace, Rip, Trace! A set of 3 Fascinating World of . . . DVD's from BrainFood Learning. Learn about Insects, Mammals and Birds. 1 Year Access to the News-O-Matic app from Press4Kids- The Daily News Experience, Just For Kids. A 1 Year subscription to Math World from 10Monkeys.com- For math fun for children in K through 3rd grade. A digital/eBook copy of both the Wild at the Zoo Adventure Pack and Bugging Around: Insects from KidQuest Science Adventures for more science fun. 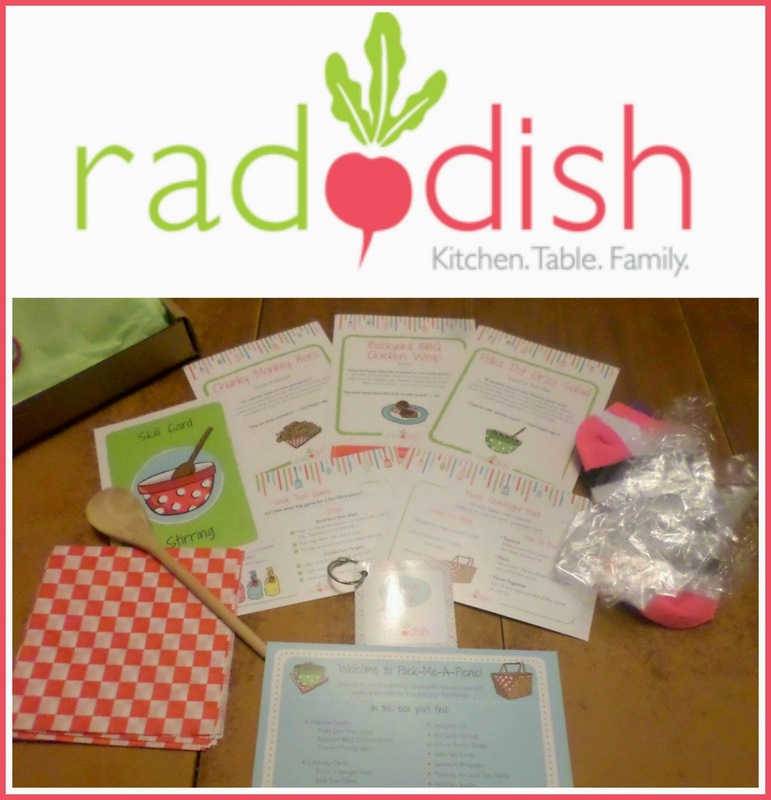 A Cooking Box from Raddish to encourage learning in the kitchen. All you need to do is enter in the Rafflecopter form below. There are only 4 simple mandatory entries, with the remainder of the entries being optional. Remember, you do not have to do the extra entries, but they will increase your odds of winning. The giveaway runs August 18th through August 31st. All entries are subject to verification. Thanks for stopping by, and good luck! Disclosure: Tots and Me received the above mentioned products for free in order to conduct thorough reviews. Tots and Me received no further compensation. This did not in any way influence her reviews. As with all her reviews, the Back to School reviews reflect her own honest experience and opinion. She only recommends products or services she use personally and believes will be good for her readers. All opinions are her own. The participating bloggers did not receive any compensation and are not responsible for shipping any prizes. Tots and Me is only responsible for shipping The Fascinating World of Insects DVD from BrainFood Learning, all other prizes will be shipped from the sponsors. I have always wanted a separate space for homeschooling. A place where we could have everything set up and not worry about it wandering all over the house. A room with a door so we could exit the room, close the door, and not see the in progress experiments or drying art projects. A space large enough with a comfy couch for snuggling and read alouds yet also big enough for a big dining room table for experiments and “seat work.” Oh and of course plenty of shelf space for great books. I’d love a closet to store book supplies. Oh and a desk for mom with space for a computer, printer, copier and scanner. Yes that was my fantasy. My reality? We live in an 1100 square foot 3 bedroom house with no attic, no basement and no dedicated storage space. 2 parents, 4 children and 2 cats. We moved here when my oldest was in Kindergarten. She’s about to start her sophomore year in college. The girls were so little that we put all four of them into one bedroom. We tried using the 3rd bedroom as a school room but it didn’t work for me. There was not enough room for what I wanted and the littlest ones were too much underfoot. It felt cramped and claustrophobic. We quickly converted the “schoolroom” into a “playroom.” This worked for us for many years as a way to contain the toys. Today that room is a bedroom. The 15 and “neurotypical” 17 year share that room. The college girl and Supergirl, my developmentally delayed 17 year old, share the bedroom they once all shared. In my reality, I have no space that I can dedicate completely to home schooling. I do think it is important to create a distinction being school time and non-school time. I also think it is important to find a balance. I never wanted home school to be “school at home,” but I also didn’t want to be so relaxed that we had no structure or discipline. I’ve thought about using the family room as the school room but couldn’t quite bring myself to give up the family room. Our living room is too open. I think of it as our library and music center: bookcases, couch, rocking chair and piano. I do like using the dining room table for seat work, especially when teaching handwriting. For many years we did reading aloud in the living room. Now we tend to do reading aloud in the family room since the futon is gone and we moved the larger couch from the living room to the family room. Science was done at the dining room table or the kitchen counter. DVD Lessons happen in the family room. Turtlegirl’s favorite place to do school is the kitchen counter. She has many computer based courses and she sets up her laptop and her notebooks. It keeps her accountable because I can see her and because we have to have the counter to make dinner, she stays on top of putting her work away which means she is less likely to lose her notebooks. She does have literature books to read and she does move to a couch for those. Supergirl and I sit at the the dining room table to do her work. She has a special chair that allows her to be the right height for the table and gives support for her feet so they are not just dangling. This is optimal for her as she learns to write. We move to the loveseat in the living room or the couch in the family room for snuggling, reading practice and mom’s reading aloud. Tailorbear is my wanderer. She loves to do her reading and questions for history on a couch but I make her sit at the table to do her computer based classes. Sometimes she likes to go to my bed do her literature readings. I think she likes my room because George the Cat will seek her out there and snuggle with her while she reads. Our dinning room is the closest thing to a centralized school location. We have a tall wooden cabinet, a small wooden cabinet, a tall bookcase which holds resources and magazine racks with notebooks and workbooks, a short bookcase, and a wooden frame that holds bins. What I’ve learned in 18 years of homeschooling: a separate, dedicated space isn’t necessary. The dining room table, kitchen counter, living room couch, bed, or floor all work just fine. We just have to be a bit more diligent in putting away our school things at the the end of the day so that we can make dinner and have family time. I think having a home school house instead of a home school room emphasizes the idea that learning and education are not confined to a classroom or set hours of the day. But I still long for a place to stash all of our stuff! You might want to check out my post I Need Organization to Keep My Sanity! and Organizing my Home School Stuff. 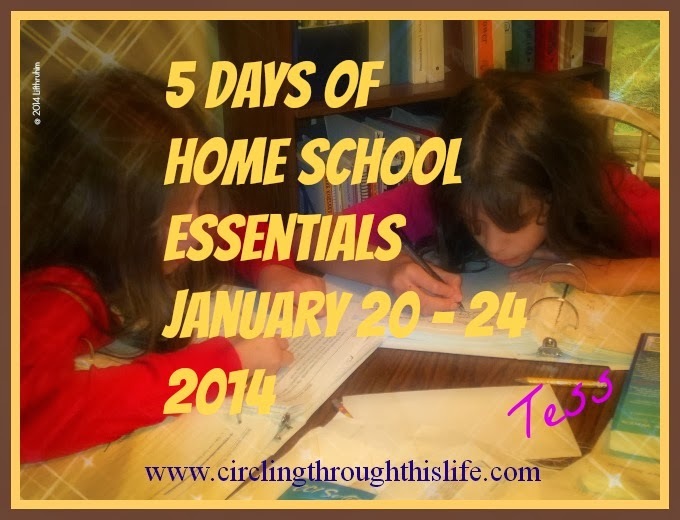 Do you have a dedicated home school space? Are you like me and school everywhere in the house? Does that work for you? As I said earlier this week, we have tended towards a year-round/take-as-much-time as-we-need approach to home schooling when the girls were younger. There is just something about taking a least a couple of weeks off at the end of summer before beginning a new school year. We’re odd ducks here because I call it the first day of school and it is the start of a new school calendar but we might not actually be starting new curriculum. We might just be picking up where we left off. (For Turtlegirl, especially, we are not really starting anything new in September.) But I want there to be something different. Something special. Something that marks the changing of one school year to another. One thing that I have always done was, to quote Turtlegirl, “pass out pretty new school supplies like new pencils and notebooks. That’s always my favorite.” BooBear remembers that back when we used Sonlight I would often save “Box Day,” the opening of the box with all the wonderful new books, for the first day of school. Most years I do take First Day of School pictures. Tailorbear tells me that she doesn’t necessarily like those but she does like the school supplies. I am planning to take first day of school pictures again this year. Sorry Tailorbear you’re stuck! Some years we would go out to dinner and there has been a time or two when we’ve gone out for breakfast. This year we’ll have a big breakfast. I’m thinking waffles and sausage or waffles and bacon. Our official first day is September 1st which happens to be Labor Day so I suspect bacon cheeseburgers will be on the menu with my baked potato salad. It is our tradition to take that first day and set up notebooks and organize the magazine racks that hold spiral notebooks and workbooks. This year, in addition to passing out color coded spiral notebooks, I’ll be handing a Student Log Book to Turtlegirl and a customized student planner to Tailorbear. Speaking of color-coded spiral notebooks let me take a moment to tell you what I mean. Each summer, during the back to school sales, I pick up several spiral notebooks. I pick up about 10 in 4 3 colors so that each daughter has her own set. We can tell at a glance whose notebook is lying around by the color of the cover. I also like having colored post it tabs and note pads, and highlighters to help me see at a glance who is leaving me a note, or where each girl is in a shared book. I even use those same colors to color-code the girls in Homeschool Tracker! I just want the first day of school to be fun, memorable, and set a positive tone for our school year. Do you have any special traditions for your First Day of School? Schoolhouse Review Crew Back to Homeschool GIVEWAY! Don’t forget to enter the Back to Homeschool Giveaway. Over $1300 in prizes! There will be two winners selected. Prizes include PayPal Cash! Over 50 Schoolhouse Review Crew Bloggers are participating in the Back to Homeschool Blog Hop! Then click on the banner below to read even more Back To Homeschool Posts from the Schoolhouse Review Crew! For the last three days I’ve talked about planning. When I plan, I start with determining my school calendar and then I begin figuring out my course of study. Yesterday I talked about types of planners. Since I’m working through our course of study I have lots of curriculum on my mind. Because we get to review so much great stuff we often set aside a program and then come back to it. Some of the curriculum listed is “in progress” and we want to finish it. Math: She’ll finish up CTC Math Geometry and then go back to VideoText Algebra. She is nearly 1/2 way through both but might not finish both before the end of the year. That’s OK. When all is said and done she’ll have 1 Credit Algebra 1 (already has that), 1 Credit Algebra 2 and 1 credit Geometry. Social Studies: Sonlight Core 300 20th Century World History. Once we finish that we’ll switch back to Humanities. Humanities: We fell in love with Roman Roads Media and the Old Western Culture: The Greeks program. I want to finish world history and then we’ll dive right back into Ancient Greece! Science: We set aside Chemistry to use Supercharged Science. Sadly our subscription will be ending but happily we can get back to High School Chemistry in Your Home. Russian: Turtlegirl is still working on Russian with Mango Languages. Our subscription will end in January so she’ll be working hard to get as much done as can before then. Latin: We fell in love with Latin when we reviewed First Form Latin a few years ago. We’re nearly finished with Second Form Latin. Then Turtlegirl would like to do Third Form Latin. This list is what I want to cover at some point with both Turtlegirl and Tailorbear though not sure of when Tailorbear would do them. Philosophy Adventure: Several months (a year?) ago I entered a homeschool giveaway and I won! One of the items I won was Philosophy Adventure from Homeschool Adventure Co. We loved Wise Woman Literary Analysis Questions when we reviewed it. We think we’ll love Philosophy Adventure too. We may have to complete this one after history and before humanities. Computer Science: Turtlegirl started Teen Coder c# Series Windows Programming and nearly finished it. We want to finish it and move on to Game Programming. Logic: We were blessed to review Art of Argument and Discovery of Deduction. Classical Academic Press also sent me Argument Builder. Boobear was able to work through all the materials before she graduated. Now I want Turtlegirl to get back to them. SAT Prep: I love College Prep Genius! I think the reason Boobear did so well on her SATs is because she completed the College Prep Genius SAT Prep DVD Set program we reviewed several years ago. Turtlegirl started this and then set it aside. It’s time to pull it out again! Art: We have two high school level books from Artistic Pursuits. Book 1: High School Book One: The Elements of Art and Composition and Book 2: Color and Composition. Math: VideotText Algebra. She’s about 1/3 of the way through the program. When she is finished she’ll have two credits for math: Algebra I and Algebra 2. Social studies: History: Sonlight Core 100 I love Sonlight and we have used every level from Prek through 300! I have not used Core 400 or Core 530 (or whatever it is now). Tailorbear has completed 1 semester but needs to finish the other. After that she’s wanting to do British Middle Ages from Heritage History. English: We’ll be receiving Fix It Grammar from IEW just in time to start the new school year (look for the review at the end of September). We’ll also be including literature studies such as Wise Woman study that Turtlegirl completed. I am also looking at Literature Studies from SchoolhouseTeachers.com. German: She wants to study German so we’ll stick with continuing Mango Languages for now and then see what we can find for the second half of the year. Science: Biology, but I haven’t made a final decision about which program to use yet. We own Apologia Biology 2ed. and we own the D.I.V.E CD. Boobear and Turtlegirl used it but there is some possible science in the future with the review crew. If we do not review that we will use the D.I.V.E. program with the Apologia Exploring Creation with Biology as the spine text. Do you have high school students? What are you planning to use in your home school? Planning: Digital, Paper, or Both? On Monday I talked about Planning: The School Calendar. I use the School Year Calendar tool in Homeschool Tracker Plus (HST + )to create the school calendar. This is a downloadable software. Unfortunately, it is no longer being offered but Homeschool Tracker does offer Homeschool Tracker Online. I love Homeschool Tracker. It is the tool I use for long term, re-useable, undated, lesson plans. It is the tool I use most frequently for creating assignment sheets. I created BooBear’s high school transcript using HST +. As much as I love HST and the ability to type things up on the computer, in my heart I think I am still a pen and paper kind of gal. That’s why I posted about Planning: The Course of Study. I do use a combo of digital (PDF) and print when doing some of my course of study planning. Some things are just easier for me to have in paper and pen format. This week I’ve been using the Curriculum Planning Sheet in the Hey Mama! Schoolhouse Planner 2014-2015. This is the coil bound printed planner, a smaller version with some of the same great forms as the 2014-2015 Schoolhouse Digital Planner. I’m not using this form in the traditional sense though. I am using it to list out curriculum I already own but want to use. I’ll use the Curriculum Planning Sheet to help me finalize the Course of Study sheet. Thanks to the Schoolhouse Review Crew, I have so much curriculum that I often forget what I do have. I could do this on the computer but I really like having these sheets printed out and bound together so that I can page through them. I will be using a combination of paper, digital and computer based tools to plan our lessons and track our progress. Though I am using the Curriculum Planner Sheets in the printed Hey Mama! Planner, I am using the blank weekly pages for Supergirl. I really can’t get too detailed too far in advance with her but I need to do something. I’ll use the weekly planner pages to jot down some basics that I want to cover that week and then fill in each day what we actually get done so that it becomes a record of work accomplished. I’ll be using the Books Read This Year pages for Supergirl to record the books or stories she reads to me and to record the books read aloud to her. Tailorbear wants more accountability. She needs a more detailed assignment sheet, not just a check off list of subjects. We decided the Student Log Book we’re reviewing with Turtlegirl just isn’t going to be enough for Tailorbear. I’ll be printing and then binding a quarterly planner for her. It will include monthly calendars with NO School days clearly marked. I’m creating these from the 2014-2015 High School Schoolhouse Digital Planner. I’ll be using Homeschool Tracker to create specific assignment sheets and I’ll print those out a quarter (roughly 9 school weeks) at a time. I think I’ll also include some printed pages from the Digital Planner for a Reading Log and tracking hours. She’s excited because she’ll have a bound, personalized planner that she can use to keep herself focused. This will be an interesting year for me. Three students. Three different planner styles. One teacher mom. How do you prefer to plan? Do you use computer based? Digital? Paper? Or are you like me and use what you like from different sources? This was Day 3 of Planning. Did you catch Planning: The School Calendar and Planning: The Course of Study? Tomorrow I’ll share Curriculum Favorites and be sure to come back on Friday when I talk about our First Day of Home School Traditions. Before I can make lesson plans or create assignment sheets I must know what we are actually studying. My two favorite planners for planning our courses is the Course of Study page from the TOS Schoolhouse Digital Planner. Did you know that if you purchase a membership to SchoolhouseTeachers.com you get access to all of the TOS Digital Planners? I know I digress but tomorrow I’ll be talking more about the different planners available from The Old Schoolhouse. Yes, it’s a digital planner but what does that mean? It means that it is a PDF. It is not software like Homeschool Tracker Plus or Homeschool Tracker Online. But the TOS Planners can be printed out or you can just type right into the planner. You can use the SAVE AS to create a planner for each of your children. When I first start to plan the courses I print out a copy for each of my students. This is like a scratch copy or rough draft. I list out the subjects we need to cover and I fill in all the materials I have on hand to teach that subject. Sometimes, okay, frequently thanks to the Schoolhouse Review Crew, I’ll have to make decisions about which materials to use now and which materials to put aside to use later. My Course of Study for Supergirl shows that I have 4 items I can use for Bible or Religious Instruction. I have Bible Study Guide for All Ages, Who is My Neighbor, and What on Earth Can I Do. We used each of those programs to write a review and I want to finish all three of them but I can only use one at a time. I also have this lovely Children’s Activity Book that explains the Divine Liturgy. This is when I have to pray and think through goals. What do I want to focus on with Supergirl? Sometimes it is helpful to write out goals. The TOS Planner, both digital and printed has goal sheets. Donna Young has some nice ones. I am partial to her Marble themed ones. Once I have chosen what I want to cover and what materials I want to use, I type these into the Course of Study in the digital TOS Planner. I can save the whole planner but instead I “print” just that one page. I print to PDF so that I can easily grab that page when I set up assignment sheets. The Course of Study is my Big Picture. Using the map analogy it’s zoomed out so all see are are the states and the countries but not the little roads or towns. When I get behind (as I always do) in creating assignment sheets, the Course of Study is my anchor. I can put it up and go oh yes that’s what I forgot to put on Turtlegirl’s checklist. Do you a Course of Study sheet or a Goals sheet when you plan? Do you have a favorite?